Imagine if you may - a Toyota Corolla with an adult driving and two children in the back. Upon closer inspection, you see that all passengers appear to be singing along to a tune on the radio. You see their mouths open wider and wider, with their eyes starting to bug out. Then you see what appears to be a scream - mouth wide open, eyes squeezed shut, neck craned upwards. That would be us attempting to sing The Phantom of the Opera's namesake song "Phantom of the Opera". And the ending (high E for goodness sake!) doesn't sound so great (that's when we are screaming). Erica watched the movie adaption of the musical on TV last weekend and was completely enthralled by the whole thing. Scott and I loved the musical back in the 90's, so we already own the original London Cast recording and the sheet music. So we pulled it out for Erica to enjoy. By "enjoy" we mean play over and over and over and over again. She seems highly partial to the "Phantom of the Opera" song, because that's all she wants to listen to. It has even toppled Taylor Swift off her pedestal of most listened to artist in the car. But we are all having fun. Things don't start sounding like a wailing cat in heat until the very end, when we are attempting to sing (screech) notes above G. After the high C's and E's, we all burst out laughing because, well, we sound like wailing cats in heat. Erica has been adamant about keeping the windows rolled up on the car as we drive through town - smart girl! 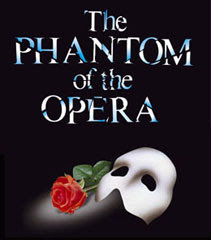 Seriously, Erica has a very nice voice and if she sang more and was standing up, she could probably get to the point where she could hit the high E.
And if Phantom comes to Chicago, we need to go see it.